In a small bowl mix together brown sugar, cinnamon, and and ground nutmeg. Roll out Crescent Roll Dough, separating 8 triangles carefully. Add 1/8 of sugar mixture and sprinkle raisins evenly. Roll from the widest part toward the point. Arrange 8 rolls with smallest roll facing upward. Bake for 12 minutes. Remove from heat and allow to cool 10 mins. In a small bowl whisk powdered sugar, water, and cinnamon. Icing should be thick and viscous, but no lumps of sugar. Spread icing over Crescents and serve. It’s no secret that we Mexicans are known for our salsas. While the most common salsas are tomato-based red salsas, there is nothing in the world quite like a tart and spicy salsa verde (green salsa). Salsa verde and tomatillo salsa are actually the same thing, as the green color comes from the green skin and flesh of the tomatillo. This is our family’s recipe for salsa verde. I use it in a number of dishes, from Braised Pork to Chilaquiles or as a topping for tacos. You can adjust the heat level by reducing or increasing the number of chiles you include. But cuidado (careful)—the spiciness of the serranos and chiles de árbol may have you looking for the closest ice-cold beverage. Peel the husks off the tomatillos and rinse them thoroughly under lukewarm water until their skin is smooth and they are no longer tacky or sticky. Place the tomatillos, serrano chiles, and onion in a large saucepan and add enough hot water to cover. Place over medium-high heat, bring to a simmer, then reduce the heat to medium-low and simmer until the tomatillos change color and just start to soften, about 5 minutes. Remove the ingredients from the pan using a slotted spoon and place them in blender along with the garlic. Reserve the cooking liquid. Meanwhile, heat a skillet or comal over low heat. Add the chiles de árbol, and toast for 1 to 2 minutes, turning often, until they darken in color but don’t burn. The seeds will come out as you toast the chiles—you can use them or not depending on your heat preference.. What you are looking for is a darker, almost black, red color. Keep your windows open as you toast the chiles, as the fumes from the chiles can affect the strangest parts of your throat and cause cough attacks for the family . . . ahhh, the memories. Add the toasted chiles de árbol and seeds to the blender, pour in ¼ cup (60 ml) of the reserved tomatillo cooking liquid, and blend on medium-low speed until your desired consistency has been reached (see Notes). 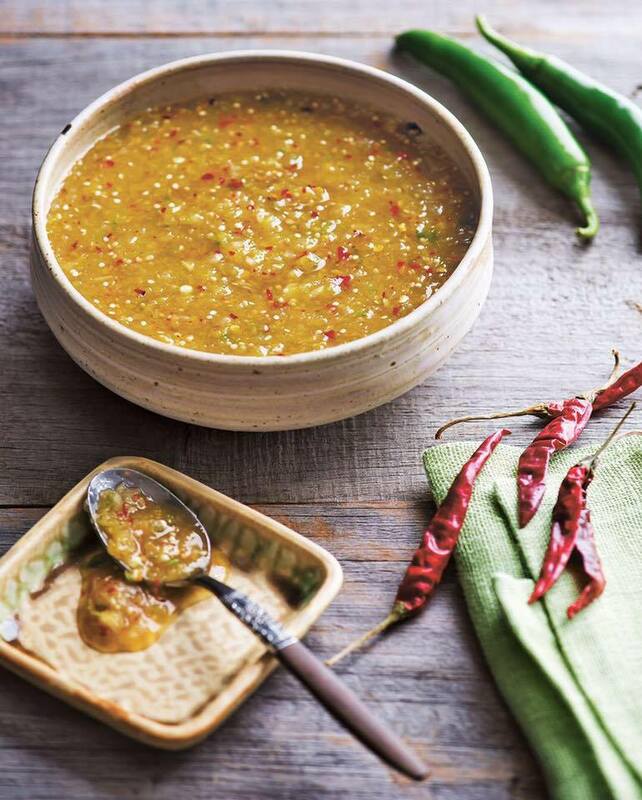 If your salsa is too thick, add more of the tomatillo cooking liquid. Pour the salsa into a bowl and season with salt, starting with about 1 teaspoon and adjusting the amount as needed to balance the tartness of your tomatillos. The consistency of salsa verde varies depending on the dish you use it in. For Chilaquiles, make it a bit more on the liquidy side so your tortillas can soak up the salsa. For tacos, stick to a coarser and chunkier consistency to avoid a runny mess. Keep in mind that chiles can vary in spice depending on the season, so you may want to cut off the edge of one of your chiles and taste it for heat. If it’s too hot for your liking, remove the seeds and veins to turn the heat down. To turn up the heat, add more chiles. Make sure not to touch your eyes after handling spicy chiles or to wear gloves when working with them to protect your hands. The last thing you want is to start crying like a novela (soap opera) star.